Germany’s EnBW has launched a subsidiary in Taiwan, which is said to represent its official entry into the Asia-Pacific energy market. 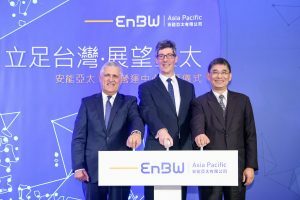 Based in Taipei, EnBW Asia-Pacific Ltd. is expected to allow EnBW to find a bigger arena for renewable energy in order to expand its development. EnBW said it plans to share its experience by participating in Taiwan’s offshore wind projects and anticipates to team up with local partners to realize the energy transition. In the future, the Asia Pacific office will be responsible for the development of wind farms, the training of operators and the transfer of wind farm O&M technology, EnBW said. By establishing the new office, EnBW also stated it looks forward to cooperating with Taiwan in exporting the energy transition experience to other countries in the Asia-Pacific. According to the German company, Taiwan is at a critical point in the energy transition and has proven itself to be one of the leading markets which offers a stable environment. “As a fully integrated utility covering the full spectrum of the energy sector, EnBW has long-standing experience working in the Engine Room of the Energy Transition,” said Markus Wild, General Manager of EnBW Asia-Pacific. To remind, EnBW invested in the 2GW Formosa III offshore wind project in Taiwan at the beginning of 2018, becoming the partner of Swancor and Macquarie Capital.